Beautiful jars!! My first ones were broken when they arrived and the seller was absolutely wonderful with getting replacement ones out to me! Thanks again!! Tiny vases are in stock! For ultra-cute place settings. Hi and welcome to Tillist Goods! My name is Pavla and I'm the founder and curator of this little shop which features quality apothecary glassware crafted in the Czech Republic in the same style for over 100 years. The shop is currently based state-side, in sunny Southern California. What began as a design frustration in my own kitchen ultimately led to the sourcing of these beautiful glass vessels. I wanted a way to keep my spices and oils preserved and organized, but on-hand and in view which meant that the vessels had to be beautiful. None of the options I found offered the kind of artistry and utility I was looking for until I came across some old laboratory glassware in a vintage shop. Though they were just what I had imagined, "vintage" also meant an incomplete set and questionable cleanliness. So with a bit of research and an adventure back to my Czech roots, I was able to find true apothecary glassware that checked everything on my list. Each product I select offers function, form, utility, and tradition. Each product serves an important purpose in decor—bridging traditional and modern, and grounding contemporary décor in an appreciation of our heritage. By choosing to focus on glassware rather than plastics, I hope to encourage recognition of the joy and permanence of quality materials, and the long-lasting and superior storage capabilities of high-grade glass. Hope you will appreciate these wonderful attributes, too! 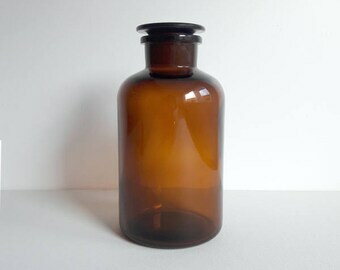 Glassware jars and lids may have visible lines from the mould, and minor imperfections and air bubbles due to the nature of the glass-crafting process. If any damage is incurred during shipping, a claim for refund can be filed through USPS or FedEx via the included insurance. All items are shipped via USPS or FedEx (1-3 day) to your doorstep with insurance, and tracking number. All glass is hand-wrapped appropriately to prevent breakage. International shipping is currently on a case-by-case basis, with minimum quantities recommended. Buyers are responsible for any in-bound duties, VAT, or customs fees charged by their locality.